The American bagged a much improved score of eight in Sunday’s defeat at Newcastle - in a meeting he’d been targeting to develop his away displays. And while he still acknowledges there’s room for further improvement, he’s hoping he can build on that over a hectic Easter weekend for the Tigers. “I felt a lot happier with the way I rode and of course with my score on Sunday,” Nicol said. “It was pretty much double what I’d been scoring in the previous meetings so it was definitely another step in the right direction. “I said going into that meeting that that’s all I want to do each time I go out there on my bike - make some kind of progress. “So I was definitely happy about that and hopefully I can build on that even more. “My starts were a lot better and as we know by now, that always makes life that little bit easier. “I got passed in my first couple but then I got a race win in my third to move me onto seven. “My last three rides weren’t too good and it’s a shame I couldn’t have seen the meeting out a bit better. “But like I say I’ll take the positives from that one into what is a big weekend for both myself and for the team. “I’ve been to Scunthorpe before so I’m hoping for another good meeting there and I already know Leicester will be something of a Challenge on Saturday. 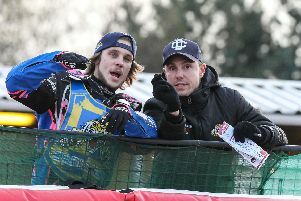 “But I’m hoping another couple of good meetings will keep my confidence high to take me into Sunday’s meeting at Sheffield because that’s going to be a big one too.